One of the last things you probably think about when going to an airport is getting injured. Of course, you are concerned for your overall safety and we all trust that law enforcement be vigilant to protect us from terrorist attacks. Slip and fall accidents or car accidents at the airport are probably the farthest thing from your mind. But these accidents happen – and more often than you might think. That is why you should speak with an airport accident lawyer if you are hurt from any type of accident at the airport. At the Wolfson Law Firm in Fort Lauderdale, our Fort Lauderdale–Hollywood International Airport Accident Lawyers know what to do if you were injured in any kind of accident at the airport in Fort Lauderdale. We will fully investigate the facts of your accident and make sure that we identify all potential defendants. In many personal injury cases, more than one person, corporation or entity might be responsible. Our FLL airport accident attorneys understand the need for an in-depth and professional investigation and analysis. If you were injured at Fort Lauderdale-Hollywood Airport, then your potential recovery - physically, financially and emotionally – depends on holding the responsible party or parties accountable. That is how our FTL Airport Accident lawyers can assist you. All you have to do to get us working on your case is to call us at (855) 982-2067 or make an appointment at our offices in Fort Lauderdale, Miami or West Palm Beach. We can also come to you wherever and whenever is best for you. The airport in Fort Lauderdale was originally a Naval Air Station that was commissioned at the beginning of World War II. In 1946 the Naval Air Station in Fort Lauderdale was transferred to Broward County and became known as Broward County International Airport. Commercial flights began in the 1950s. In the 1960s the airport operations continue to expand adding domestic flights primarily in the eastern United States. In the 1970s the airport included major airlines such as Delta, United and Eastern. In 1996 Southwest opened its base in Fort Lauderdale. Spirit Airlines followed in 1999 and JetBlue in 2000. At the present time, the Fort Lauderdale – Hollywood international Airport is a hub for Silver Airways; Spirit Airlines; IBC Airways; and Tropic Ocean Airways. Fort Lauderdale airport is also a focus city for Allegiant Air; JetBlue Airways; Norwegian Long Haul; and Southwest Airlines. Fort Lauderdale – Hollywood International Airport is also known as FLL. It is located in unincorporated Broward County and surrounded by the cities of Dania Beach, Hollywood and Fort Lauderdale. It is approximately 21 miles north of Miami and 3 miles southwest of Fort Lauderdale. Fort Lauderdale – Hollywood international Airport is close to Port Everglades and the cruise line terminals. As a result, a significant amount of the airline traffic at Fort Lauderdale international Airport consists of tourists from around the world who are connecting in Fort Lauderdale to go to Port Everglades to enjoy the various cruise lines which set sail for the Caribbean. 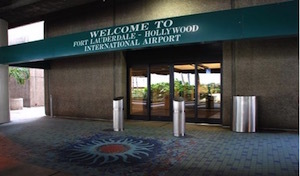 Fort Lauderdale – Hollywood International Airport is the 21st busies airport in the USA and the 14th busiest gateway for international air traffic in the United States. It is also one of the world’s 50 busiest international airports. In 2016 more than 29 million total passengers used the Fort Lauderdale – Hollywood International Airport. Accidents and injuries can happen at FLL in the parking garage and terminal. Broward County is the legal owner of Fort Lauderdale – Hollywood International Airport. The airport itself is managed by the Broward County Aviation Department. Both of these agencies are required to keep the airport grounds and facilities in a reasonably safe manner and free of hazardous conditions. When they fail, they can be held responsible for the injuries that result. Our Fort Lauderdale -Hollywood Airport accident attorneys know what to do to help you following any type of airport accident. At the Wolfson Law Firm, our Fort Lauderdale and Hollywood accident lawyers are ready to help you if you were injured at the airport in Fort Lauderdale. We will aggressively fight for you no matter the size of any potential defendant including governmental agencies, major corporations or powerful individuals. Our lawyers will stand by your side from the first call until your case is resolved by settlement, jury verdict or appeal. We do not refer cases to other law firms for litigation or trial. In fact, we routinely agree to co-counsel with other law firms on their cases for the purposes of litigation or trial. We invite you to review our recent results and client reviews as well as our qualifications. We are firm believers that an informed client is our best client. We want you to be completely comfortable with your choice of the Wolfson Law Firm as being the best Fort Lauderdale – Hollywood international Airport accident lawyer that you could find. We are available to speak with you by text, telephone, Skype, or email. To get started just call us at (855) 982-2067 and let’s discuss your airport accident and injury.